But I'm not going to do desserts but more towards dishes. This dish shall be my first. 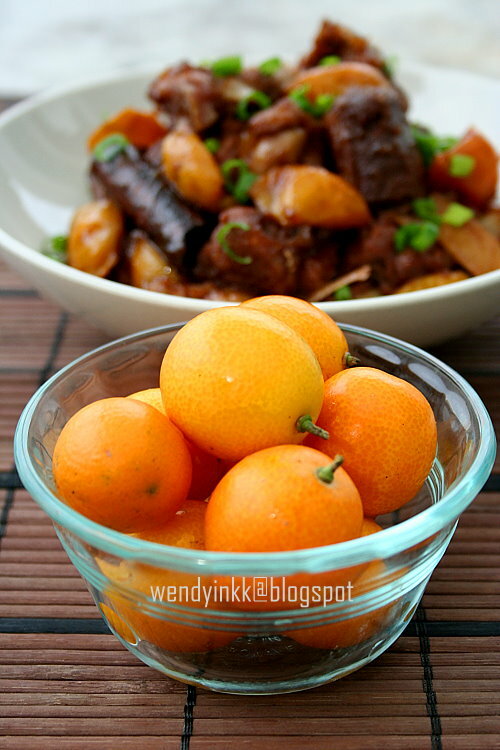 Few months back I picked some kumquats from my tree and cooked pork ribs with it and it was delicious. And when I saw this recipe, it was a must try for me! I was actually planning to use chicken. There are only 2 adults dining here nowadays and we can't finish up 1 duck. Cooking half a duck needs storage space for the other half. Since I was trying to clear my freezer now in anticipation for CNY, it's not a good idea to buy more duck. And luck was on my side when my SIL's inlaws asked me if I want any free range duck! I jumped at the offer and said, yes please, half a duck! I made some changes to this recipe due to the availability of ingredients. I can't get haw powder, I used haw flakes. No red cook sauce, I made the seasoning for this dish from scratch with basic ingredients. After cooking the dish, I took some up and packed it for my SIL's inlaws. They told me, the duck was very fragrant and nice. And the mother in law wants to replicate it. 1. Boil a pot of water and blanch duck pieces for 30 seconds. Drain. 2. Put blanched duck into wok and let it cook on medium heat until oil starts to ooze from the duck skin. 3. Put in ginger, spring onions, star anise and cinnamon stick. Gently toss everything around and let it cook until some parts of the meat start to brown. 4. Put in enough water to cover the duck. Put in wine, sugar, soy sauce and haw flakes. Bring it back to a boil and lower to simmer. Cover and let it cook for 30 minutes. 5. Meanwhile half kumquats horizontally and remove the seeds with a toothpick. 6. After the duck has past 30 minutes, put in the kumquat halves and let it simmer for another 30 minutes. 7. Reduce gravy and let it caramelize a bit (if not it won't be red cooked, hehehehe), adjust taste with more salt and sugar if needed. Haw flakes!! Haha! I never knew can cook with haw flakes. Looks delicious! 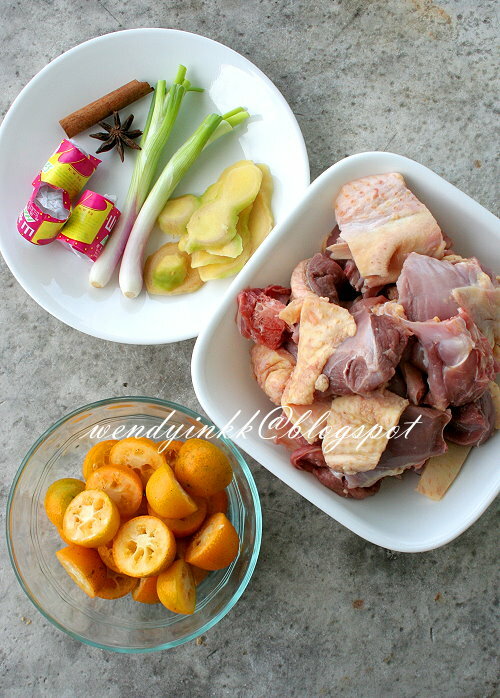 Aiyoh....mention CNY i so scared to think about what to prepare. My husband always said duck very hard to cook..look at your duck meat here oh no cannot tahan leh...I must try to cook this. The word "kum quat" immediately catch my eyes...and so am I...I loves kumquats! 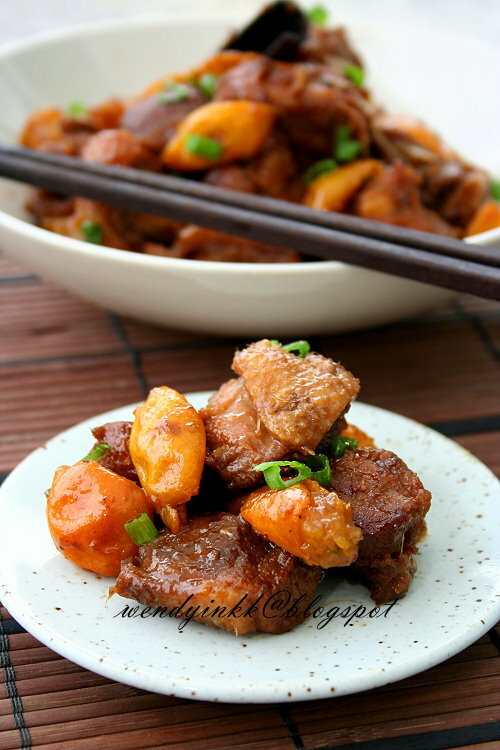 This dish looks really very delicious with that kumquat citrus taste! Loves to give this a try one day. Thanks for sharing! Wendy, you think beef chunks will work with this recipe? I love kumquat too ya! Slurp! Just make some jellies and buttercakes. No one will blame you la. I think will work just as good! MEat is just as tough and red meats too! Hi Wendy, I never know kumquats can be used this way. This dish must be really yummy [sourish/sweet] but same as you my family is to small to finish the whole duck. 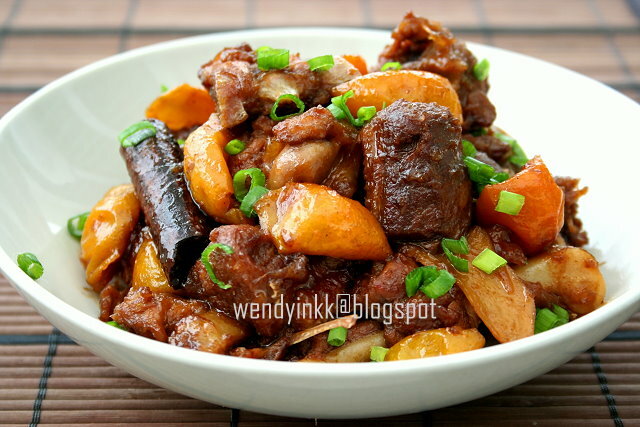 Can I substitute with chicken or meaty pork ribs? Instead of using haw flakes can we substitute with the hawthorn fruit itself? The fruit is sourish so I guess you may need to add sugar as well..? TQ, now no need to think of new recipe for duck (for CNY). I think it was good choice to use Duck with Kumquats, sort of western style of their popular Duck with orange. Sounds delicious with the kumquats and haw flakes. Never cooked with these ingredients before, but I definitely have to try it one day. Great recipe! I am not a fan of duck meat because of the smell....this would be delicious if really can musk it! Love kumquats too! Does your kumquat have fruit all year round? I have a tree and there's no season for it.